One of our most popular kites last year, the Applique Diamonds now have eleven designs. Framed with indestructible fiberglass, these kites are easy to fly. Ideal as birthday gifts and as home decorations. Eleven Designs in one 24 pack. 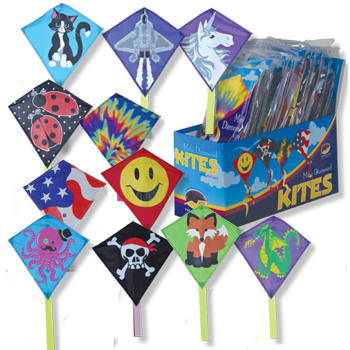 Each kite is individually packed with line and tail.